Hamish lives upstairs in the hot loft. Thinking thinking. Um di doo. I have pains in my chest about the shape of the paper that I submitted weeks ago. Mmm. So many ellipses of sensible query and closure. However there are new and exciting ventures ahead. Indeedy. I do have animation waffle to 'submit' to this place I've called 'blog' for many months now. Snazzy new must-have book called Animation Now. Such a great book! Such a crap name...and the cover, well I would be much happier if they'd pictured a Piotr Dumala still on the front. Or Pritt Parn. Anything but big green Shrek 3D face. Currently listening to The Love Boat theme song. Such pleasant cheese. Travelled up to Canberra with Hamish and Kirrily (the 2nd) today. 8 hours of non-stop fun. Many locusts were killed by our vehicle. New Year. Yes it is coming. I resolve not to be cheeky. My library books are due back on the 17th of January. Goodafternoon. The paper is in. I have finished. Well it is in and I haven't finished. Well I have finished, but it doesn't feel like I have. No I haven't finished because there is so much more to unravel from the shamozz of words delivered in the said paper. So I haven't. Finished. But maybe I have, I don't know. Such a mysterious world we live in. Speaking of finished, because it has, I went to see the William Kentridge exhibition in Sydney last week. It was fantastic. It would've been a great exhibition to visit several times, as there were many animations to watch. Thats all for today. Thankyou. Goodbye. Here is my definition of improvisation. ∑ Improvisation is a creative act that generates form or content intuitively, in the moment without a set text to follow, for a continuous period of time. The outcome is true to the process; it is not edited during the act. I wont be harping on anymore until the joyous paper is handed in. 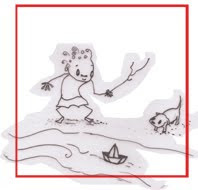 Zdenek Miler (Czech ) is the creator of Krtek, or "little mole" . I remember feeling very moved by a couple of Krtek books as a little nipper. 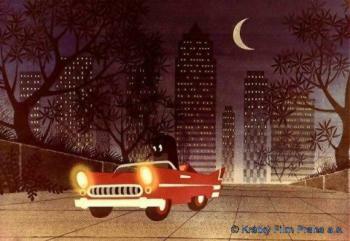 I think all of the animations were made at Krátk˘ film, Prague. I'll look into Kratky films later. The beastie (pictured on the far left) was scuttling around the picture rail in my room on Friday night. It's movement was fluid and swift and it's overwhelming clatter of legs fueled me with adrenalin. I had a vision of it hurtling into my bed and scuttling up my nose or in my ears. After a few jousts with a large stick and a flick of a rolled up bit of paper ( a piece of my research paper infact) it was tossed out the window. It writhed and wriggled as it fell one story down and landed with a "paff" onto a big pile of leaves. Yich!! I spotted a tortoise today on my travels. Well it's nostrils atleast. They were just popping out above the water cruising along. At first I thought it was just a pair of nostrils out for a swim, it was such beautiful weather today. Then softly his little eyes appeared along with a hint of shell. I really wanted to see his excellent little legs paddling away but he dissappeared. So I continued on my merry way, though as I turned back I saw the nostrils re-emerge further away. And so. An excerpt from my paper. Just for me to ponder. Often I find that I tend to refine thoughts in the process of blogging. Willliam Kentridge explores components of his narrative utilizing his rich source of experience that includes a long history of working with the same methods and materials and content/theme/characters. 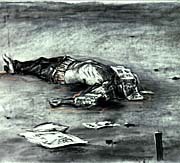 One suggestion of a technique is to include improvisation in the production stage of animation, and to adhere to thorough pre-production exercises, as Kentridge does. The outcome of the work may reflect the animator’s current level of skill and this is precisely the point that needs to be made, that the technique of improvisation needs to, and can be acknowledged and developed as a skill, along with the many other skills that are necessary to develop as an animator. As with the comparisons I have given, there are dancers, musicians and theatre actors whom have improvised from very early on in their career, however those who choose to continue to work with improvisation as a technique to include, or to perform within their craft, have developed a sophisticated language that involves a developed skill of an improvisation technique. One could say that their pre-production has included this development of such a language. Words about Kentridge in particular. His films "Fragments for George Melies", and version of Melies' "Journey to the Moon". The talk at VCA on Thursday. I found a book illustrated by Jiri Trinka today, with original lithographs in it. The Anima site is so fantastic. Worth spending many hours reading and watching. I suggest the Optical toys section. At the other end of my excitement is disgruntlement. I have to pare down my research paper. I found some old stuff from an exhibition in 96(?). Brown paper, ships and Morris the cow. Hmm. Nothings changed much. I am talking about different forms of engagement within the practice of the creative arts. Improvisation is an exercised technique utilized and valued in many other creative mediums. On the basis of the case studies that I have been invesigating I have gathered examples that define improvisation as a valuable technique that can be utilized and practiced in the medium of animation. If one were to echo the techniques of the Playback Theatre or of the dancer Twyla Tharp to an animated production then this would position the improvisation technique into the highly structured process of animation. When animating, the creation of improvised drawings is not nearly as fast as moving one’s body around spontaneously or feeling and expressing an idea in the moment. However, if the animator using the straight ahead 2D technique has set up pre-production in such a way to allow for a sense of flow during their drawing process, (I argue) that this animator can improvise a) the movement of the subject, and/or b) the narrative. I keep coming back to Kentridge, not because he proclaims to improvise, or because the narrative in his animation is solely improvised, but because his methods and animation process allows for improvisation. The content informs the process and the process informs the content. He resolves ideas in the moment through the process of animation. "The drawings done for filming generally have to be done quickly. Speed in the drawing. Confidence of work…if not unconsciously, intuitively through the body, through the movement s of an arm.."
Kentridge from “Drawing the Passing Process", a documentary on the work of William Kentridge”. Improvisation in animation is not extensively written about. In documentation that pertains to the commercial animation industry the process is often acknowledged as a risk to valuable production time and risky in the sense of creating animation that is visually inconsistent. Documentation that investigates; history, aesthetics, small production houses and artists as animators, provides an acknowledgement and sense of value for improvised techniques. As is the case with researching other creative arts practice, the question of “why do it?” is not the core reason behind the investigation. It is more a question of providing definitions of techniques that can be structured into the production process. Defining improvisation via the means of a comparative analysis houses these definitions within the frame of value. The act of creation contains improvisation. I'm trying to define it as a technique so as to structure it into the maticulously planned medium of animation. does not know the technique needed in all creative work. Such a person thinks of inspiration as a kind of miracle, a hypnotic state that somehow settles all material problems. We aught to get rid of this legend of the inspired artist, living quite outside the world. The artist is responsible for what he does. He must use his own clear-sightedness to make something vigorous which respects the logic of the characters, the dynamic form of the film, and its technical demands. Improvisation becomes merely a certain form of sensitivity to the demands of the particular moment; for instance, when its a case of altering something at the last minute. In other words, it is concerned only with detail. The complete work must be carried out with mathematical precision." I think Fellini is defining what Csikszentmihalyi calls 'flow'. 'Flow' is contained within the process of improvisation, improvisation is contained within the process of creativity. The shin bone is connected to the knee bone. Revisiting music that is soft and full in my heart. Yesterday I visited P, he has just come out of hospital having just had an operation on his heart. He was dressed in pale blue pajamas covered in white clouds. My gift was strawberries. Agnes smelly pooch seemed happy to have him back. I talked to P about the film 'Tin TIn and I', how beautifully constructed it was, and how it touched upon certain ambiguities that occurred in WW2. Perhaps I wanted to tell P more about how touched I felt by the film. It didn't directly talk about Herge's actual crafting of Tin Tin, yet everything explored in the film pertained to the act of creating marks on a page, creating characters. Of expression through the creation of these characters. What an incredible life of drawing. Its funny, I didn't expect such a sensitive film. Agnes McSmell and D left to see someone about sky lights. It struck me on this visit to P, of how little sky I cast my eyes on in my current climate. The clouds were beautiful yesterday. P showed me one of the first books he had as a child. It had very rich colours and beautiful lithographic marks, washy tush tone and litho crayon. The typography was all hand set. It would have been an edition of 1100 (from memory?). 'Just' a book for children. We looked at a few books illustrated by Jiri Trinka. They are fabulous and beautiful. Canada collection (new at the RMIT library) that I watched the other day. Have to discuss later. Lots of educational material housed in querky, funny and sometimes dull (too many Health and Safety messages for example) animation. Pick of the bunch was The Family that Dwelt Apart. It had fantastic narration. There was also a real corker by Richard Condie in 3D! La Salla. Bizarre and funny! I'll write about that one later. Do animations have to be classified to assess/contextualize what kind of ideological 'charge' they carry/house deliver? I have to leave this here. I'll faff up my words even more if I continue. (my) Yo La Tengo (cd) finished filling the room with nifty ditties and salubrious e-bow tones too many moments ago. I now have a Mihaly Csikszentmihalyi book in my posession. All I want to do right now is finish my paper and get on with other projects. I have a vision of a pile of paper (my coursework paper) sitting on the ground. Then some gangly little pooch comes along and sniffs at it quizzically. The pooch stands back and hesitates for a second and then barks at the pile. The papers jump up frightened, and then one by one they run off, zig-zagging into the distance as fast as they can. Never to be seen again. I watched Houhokekyo Tonari no Yamada-kun (My Neighbors the Yamadas) last weekend. It was so lovely to see on the big screen. Such nice linework and design. It was very nice. Also I went to see Tin Tin and I, a very excellent film indeed. I received a very informative email from Steven Woloshon regarding his production technique for Cameras Take Five, and I am quite keen to see more of his animations. Yesterday I was reading about Ub Iwerks and Disney, about their initial beginning as creators of animation and starting the production company. It is really interesting to read about them and that time frame, as it is quite an insight into the beginnings of ( a production's) inevitable juggling between money, talent, skill, motivation, time etc. Hmm. Theres no animation on it !! Not yet anyway. Since it has been up however, my small and excited brain has been aprickle with activity. Things I want to write about but don't have time just now. ~Shrek #2 Loads of people(well animators seemingly) think its awful (the animation). Hmm I just want to pick this apart a little at some point. Is the dodgey lipsync annoying? Or can it be accepted as part of the style. How much does this matter and why? 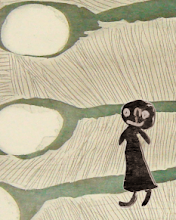 ~Melbs' International Film Festival animations. In particular Paul Dreissen's, which utterly tickled my every sense. I had to stop myself from humming "Mmmmmm, mmmmm"
Wow, such beautiful lines. Such lovely animation. Such incredibly well crafted sound. WHY did the audience shuffle so!! Ptthhh! ~The animation that Phil Mulloy wrote was very very nifty. I'll come back and pop in details. I am so tired, I think flash has aloped with part of my brain. Or induced some kind of inversion in there. Well at least I have the theme to GA-RA-KU-TA circling around in place of said brain. Now the GA-RA-KU-TA animations were truely remarkable. Real thoughts later. This is just the pencil version. "When I write a script, I lie down -- because that's the opposite of standing up. I stand up to edit, so I lie down to write. I take a little tape recorder and, without being aware of it, go into a light hypnotic trance. I pretend the film is finished and I'm simply describing what was happening. I start out chronologically but then skip around. Anything that occurs to me, I say into the recorder. Because I'm lying down, because my eyes are closed, because I'm not looking at anything, and the ideas are being captured only by this silent scribe -- the tape recorder -- there's nothing for me to criticize. It's just coming out. That is my way of disarming the editorial side. Putting myself in a situation that is as opposite as possible to how I edit, both physically and mentally. To encourage those ideas to come out of the woods like little animals and drink at the pool safely, without feeling that the falcon is going to come down and tear them apart." Styles more condusive to improvisation. The sound design moves well in the space. Funnily enough I discover that this animation is actually a 3d animation if you wear special glasses! I don't think it is improvised, or perhaps initially it was and then "fiddled" with in Post-production to make it 3d. Here is the link to contextualize the George Geertsen animation. Well and however, I think the morphing (no cuts) style illustrates my point. I RREALLY wish I could find some Bruce Bickford snippets to pop up as an example also. His claymation is quite psychedelic, and indeed "Baby Snakes" is drug induced. It is really quite incredible to watch. Thoughts about time, values and engagement with the process of creation. At the moment the threads of these ideas are loose as I've not had time to digest them all, and give them clarity. Animation is a realisation of an idea through creation. It is also an expression of an idea through the viewer's experience of the animation being replayed. Improvisation is a process to realise an idea. The process is "replayable". The animation is the remnant of the process. that idea with clarity through the remnant of their process. 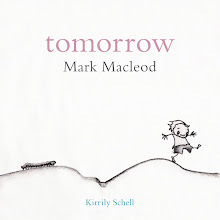 Wee hee look at this little Scott McCloud thingy! Once I've finished this "Business HOO HAA"
urge to flounder around with drawings and wot not. I will be having home-made apple pie this evening. the medium is a useful form of expressiion. Still I haven't got the structure of my paper happening. Its all so broad and fluffy. Ooh it’s been awhile. I have so many little poignant thoughts to pop in here. I've been reading about animators whos animations were a form of abstract expression/orchestration/composition using rhythm, movement, colour and form to do so. It’s quite an obvious step to take if you are exploring these kinds of ideas in other forms (painting/ sculpture/sound). Interesting that the Guggenheim Museum supported these kinds of animations for quite awhile.
" Coloured Rhythm is no way an illustration or an interpretation of musical work. It is an autonomous art, although based on the same psychological premise as music." After reading about Leopold Survage's idea for Coloured Rhythm, I had an incredible urge to go watch Disney's Fantasia. With the idea in mind that all animation is an abstraction of form in some way. Essentially Disney (in 1940) is working with the same kinds of ideas as Survage, only Disney's Fantasia is palatable for the average viewer because it spoon feeds these abstract notions by introducing them with the live orchestra and encasing them in a variety accessible imagery and narratives. Perhaps I am addressing the opening sequences in particular. Which I think were animated by Oskar Fischinger. ?? So Fantasia flopped. Commercially. Was Disney trying to sew together too many things? What if it were put in a gallery? What I've written here acknowledges a connection that could be placed elsewhere and everywhere to a certain extent. I suppose in a historical context Disney's successes, failures and discoveries are the most memorable, seen and perhaps documented.
. His early artistic goal was to combine two of his great passions, music and the graphic arts. (Hmmm sounds familiar). He's done some pretty nifty things with wax. Animators with a fine arts lineage. Storyboards. What happened before storyboards? Oh, but I'm in a fluster coz I've not finished the business "hoo haa" as yet. I have found the quote that Marcus fwd'd to me the other week. Ach! Lots of thoughts swirling around this funny old quote. But I'll just leave it up for now as a "conversation piece"...... for me and my paper that is. does not know the technique needed in all creative work. Such a person thinks of inspiration as a kind of miracle, a hypnotic state that somehow settles all material problems. We aught to get rid of this legend of the inspired artist, living quite outside the world. The artist is responsible for what he does. He must use his own clear-sightedness to make something vigorous which respects the logic of the characters, the dynamic form of the film, and its technical demands. Improvisation becomes merely a certain form of sensitivity to the demands of the particular moment; for instance, when its a case of altering something at the last minute. In other words, it is concerned only with detail. The complete work must be carried out with mathematical precision". Well. I suppose this is true. If you're a dry old crust. Last night I watched a video on William Kentridge that David passed on to me. 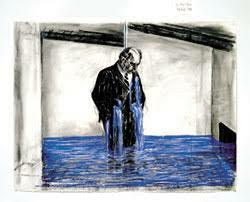 In many ways Kentridge's work process illustrates the point I am trying to make or the questions I am exploring. The content of his work is not what I am focusing upon, moreso the way he works. When I talk of improvising I am not suggesting the animator skips over the whole pre-production process. This is exactly the question. How can it/pre-production be set up to provide the "vehicle" of improvisation for the animator to explore ideas. Kentridge's act of animating during the production stage is very physical. His work is extensively researched, and the preproduction is meticulously designed so as to create the perfect environment for which to produce an animation that allows for a large percentage of spontaneous/intuitive creation. His technique is very focused...Meaning that, and I'll have to qualify this presumably if its to enter my paper, it seems his production process has been developed via a natural progression or path as an artist entering a medium that best a) expresses his ideas and b) realises (certain elements of) his ideas within the act of creation. Had a chat to D on Friday and somehow sensed a bit of ground under my feet afterwards. Animator of the week: Daniel Guyonnet. He is a Parisian fellow. Some of his work reminds me of Geoff Ricardo -Melbourne printmaker, Joost Swarte-comic artist-Belgian(?) and Al MacInnes-Melbourne animator. Splendid little walk cycles that hunch and flip. There's a wonderful sense of swing to his timing, you could almost dance to watching it. .........hmm weird grammar there, but it makes the point. I sat down to work on my AIM business plan yesterday, and somehow ended up fiddling around in Flash. On Tuesday I went to see an exhibition Earth and Sky by G .W. Bot at Australian Works on Paper. is so sensitive and balanced that my whole being feels engaged whilst I stand infront of one. ...I don't really have words for how I feel about his work, not in the context of blogging anyway. to simple and little ideas I have about production processes. His little legs are fantastic. It was really quite an engaging story, and the use of colour was bold and magnificent. It has been quite refreshing to see Trnka, Ocelot and Mulloy's animations within the space of a week. realised their artistic integrity through a long journey of ..well animating their ideas. ...I also watched alot of Plymton's animations last week. Strangely enough, since viewing Trnka, Ocelot and Mulloy's animations, Plympton's work seems to be quite shallow and unsophisticated. Of course he's a fantastic draftsman, and very b imaginative. ..I suppose he is just operating with different kinds of ideas. His production technique errs towards improvisation, swift inspired trails of visual explorations that often are quite rough and thus rely a little on sound effects. Cartoony. My last day of perching in the loft at PH's abode. these hairs have clustered their way across the carpet to permanently afix themselves to nearly every pair of socks that I own. I am most displeased. 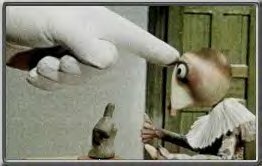 Watched Phil Mulloy's animations at ACMI yesterday. Such lovely, inky raw marks. His drawings are so rough and flustered, but they deliver his ideas perfectly. There were some parts that reminded me of Bruce Petty, the more swift political cartoony parts I suppose. Overall his ideas are quite clever and sophisticated and the way he portrays his observations of the world are insightful and offer an interesting perspective that can/could only be housed in the form of an animation. Admittedly it was quite hard work to sit throught the whole lot. Why? Well 'coz it was quite gross and thematically pretty dark. I have alot of questions that I am exploring. I think I know the answers already, so on the one hand it all seems a little naive to be researching improvisation in animation. I am asking such basic questions with such obvious answers that can be found in any animator's vocabulary or in any animation book, for example, within afew pages of Richard Williams' "The Animator's Survival Kit"
On the other hand ( I quite like this hand metaphor, if I weren't typing I'd be reveling in some form of gesticulation)....on the other hand naivity is a good suit to be in whenst investigating other ways of thinking and being. So thinking that I know the answers, and I do know them I do, is perhaps not a useful strategy whenst researching. Can I find something else??? I haven't found something else yet. Is there something else to find?? Suddenly I am writing a Country song it seems. a) A bible and a bus ticket home. What is the value of improvistion in animation? Can this be combined with, or inform, or even be utilized through the more efficient(?) animation techniques,methods or tools that are offered through software programmes? For some reason it has triggered a memory in me. One of wombats, many wombats. right term for these funny beasts? I think a 'babomba' of wombats. and distant munching, mixed with the odd grunt. Quite a relaxing sound to doze off to really. It was really quite scarey... and amusing. this memory. The bus stop scene in particular. I say 'pish' to this blog today. House and dog sitting for three weeks. Anges the smelly itchy dog. noooooo internet connection for three weeks. awful term when you think about it. Which more often than not I don't. Guitar Favourites by Norbet Kraft-theme music for the moment. Classical guitarist's hands are quite intriguing. I wonder if I could animate such hands and capture their splendidity. 'Norbert' describes his face most certainly, and 'Kraft' describes his guitary hands. Maybe we grow into our names......?